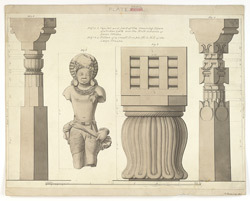 Pen and ink and wash drawing by Frederick Charles Maisey of architectural details from Sanchi, inscribed: 'Plate XXXII', with notes. Lieutenant Maisey spent the cold seasons of 1849-50 and 1850-51 at Sanchi to prepare an illustrated Govenment report of the antiquities of the site. He was joined by Major Alexander Cunningham in 1851. The result of his work was published in 'Sanchi and its remains' of 1892, illustrated by reproductions of his own drawings. The Buddhist site of Sanchi is of outstanding importance for the number and variety of its monuments and sculptures. Its numerous preserved Buddhist structures, mostly stupas, were built between the third century BC and the sixth to seventh centuries AD. The foundations of this monastic centre were laid by the emperor Ashoka (reigned circa 269-232 BC) who built the original Stupa 1 and erected a monolithic pillar in the third century BC near the south gateway. The stupa was later enlarged and encased in stone around the 1st century BC under the Shungas and four magnificently carved gateways called toranas were added at the cardinal points. Figures 1 and 2 in this drawing show the capital and the figure of the Bodhisattva Vajrapani that used to crown the pillar near the north gateway of the stupa of Sanchi. Figures 3 and 4 show two types of pillars from a small temple north-east of the great stupa.